Hi Crafters! I have 2 male cousins that are getting married soon. The first one just got married last weekend so I needed to make his Congrats wedding card and I thought I would make the other one at the same time as well. So I wanted to share what I usually do for wedding cards. It's easy, quick, and can be very elegant depending on the colors you use. 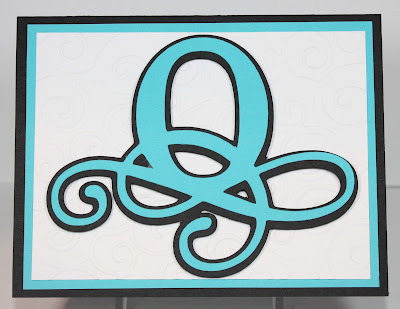 I use the monogram and monogram shadow feature on the Tie the Knot Cricut cartridge. It is a very elegant monogram. LOVE it for weddings. I try to also use their colors if I know it based off of their wedding invites. Here is the second one. Their invite shows that aqua is one of their colors so I made that their accent color. I also use the D'vine Swirls Cuttlebug Embossing folder on the white cardstock. It's really elegant and perfect for wedding projects. Sizes: A2 Size card The monogram - 3.5"
Cute cards! Great touch with the embossing on the white background paper.